AZZURRINE BATTUTI DA NIGERIA. WORLD DREAM. The adventure of the National Under 20 at the FIFA World Championship has ended at Kobe Univer Stadium. The company did not succeed in the Azzurrine, beaten 4-0 by Nigeria and forced to abandon the last hopes of reaching the quarterfinals qualification. Corradini, who had to give up the disqualified Franco, confirmed the same module used with South Korea, a 4-2-3-1 with the recovery of Lisa Alborghetti in midfield and Martina Rosucci fielded as the only point. Read more: AZZURRINE BATTUTE DALLA NIGERIA. WORLD DREAM. AZURE, OR IN OR OUT! Third and decisive appointment at the World Championship for the National Women's Under 20: at the "Univer Stadium" in Kobe against Nigeria 90 'without appeal for the Azzurrine. Either inside or outside, this is at stake in the last race of Group B (9.20 hours, direct Raisport 1, deferred 21.05). After the draw at the debut against Brazil and the setback against South Korea, Italy plays all its chances of passing the round with the strong African team, leaders of the group with 4 points and finalist in the last World edition. Read more: AZURE, OR IN OR OUT! AGAINST NIGERIA NEEDS A BEAUTIFUL VICTORY! With the defeat of South Korea (0-2) behind it, which has greatly compromised the chances of passing the round, the National Women's Under 20 has resumed work in view of the last and decisive group race with Nigeria scheduled Sunday in Kobe (9.20 hours in Italy, direct Raisport 1). A race without appeal for the Azzurrine that, after the positive debut with Brazil (1-1) and the setback with the Koreans, to continue their journey in the FIFA World Championship must necessarily beat the strong African team, leaders of the group, with at least two goals difference. Read more: AGAINST NIGERIA NEEDS A BEAUTIFUL VICTORY! An unlit Italy loses 2-0 with South Korea and puts the qualification for the quarter-finals of the FIFA World Championship at serious risk. 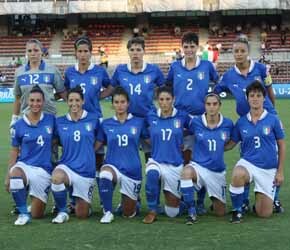 To pass the round in fact the Azzurrine will have to beat Nigeria on Sunday, who drew 1-1 with Brazil, with at least two goals. A just defeat that remedied by Italy, a distant relative of the team appreciated at the debut with Brazil. Korea, beaten 2-0 by Nigeria in the first round of the group, has put Rosucci and his companions in difficulty by showing more brilliance and dynamism, but above all managing to exploit the wide spaces granted by Italy and the numerical superiority in midfield, where The inclusion at the end of the first half of Cecilia Re served to stem the maneuver of the Koreans. Filed in the opening match with Brazil (1-1), the 20 Women's National Team is back on the field tomorrow to face South Korea in the second match of the FIFA World Cup Group B in Japan ( Italian 11 hours, direct 1 Raisport, deferred 21 hours). The match, which will be staged at the "Komaba Stadium" in Saitama, represents for Italy a genuine crossroads to fuel the hopes of passing the turn, with the Azzurrine called to repeat itself after what was good to see against the Brazilian national team.